Fall 55-29 in 2nd round of district tourney. Delaware Christian’s Anna Fuller drives by Wellington’s Eli Burkhardt during the second quarter of Wednesday’s Division IV District Tournament game in Columbus. Points were at a premium in the early going and, while Wellington eventually found its form, Delaware Christian never quite got into rhythm. The ninth-seeded Eagles were even with the sixth-seeded Jaguars with seconds to go in the first quarter. A quick 10-0 Wellington run changed that in a hurry, though, lifting it to a 55-29 win in the second round of the Division IV District Tournament Wednesday in Columbus. Senior wing Zoe Beatty beat the first-quarter buzzer to put the Jags up 8-6 after one. 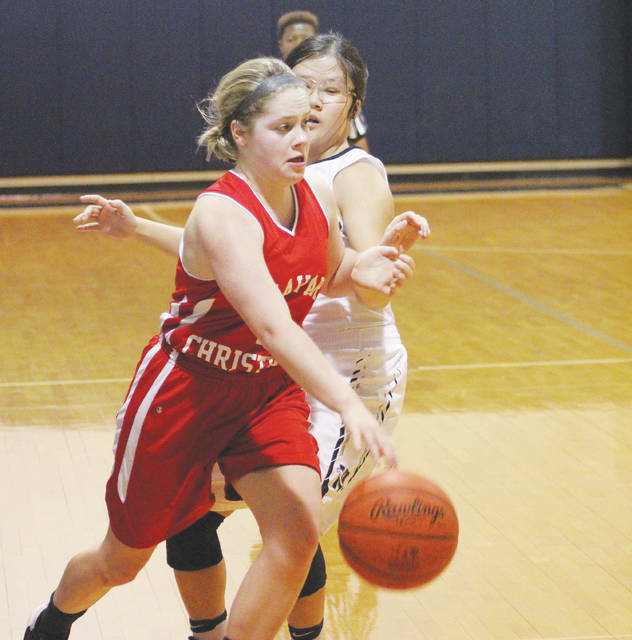 Junior point guard Savannah Childress then drilled a jumper to open the second, Beatty scored in transition to balloon the edge a bit more and senior center Annie Taylor scored a put-back bucket to cap a 10-0 run that all but sealed the Eagles’ fate. Sophomore Lyssi Snouffer ended the DCS dry spell with a three-pointer, but Wellington answered with a three of its own. Childress and the Eagles’ Abbi Maurer traded triples after that, but a Childress layin started another mini-run that powered Wellington to a 29-14 halftime lead. The Jaguars outscored the Eagles 10-4 in the third quarter and 16-11 in the fourth to account for the final margin. With the win, Wellington advances to take on fifth-seeded Granville Christian — a 44-31 winner over 13th-seeded Grove City Christian — Saturday at 1 p.m. in Granville. The Eagles, meanwhile, finish the season 12-10 — a solid result for a squad that entered the campaign with just four players with varsity experience.